Fourth Row Center: Film Writings by Jason Bailey: On DVD: "South of the Border"
Oliver Stone is a skilled craftsman who has produced a steady stream of consistently entertaining pictures, but there’s an element to his personality—arguably one of his own making—that makes him increasingly difficult to take seriously as a documentary filmmaker. There’s no denying the visceral power and emotional punch of an admittedly brilliant narrative film like JFK, but even Stone admitted to its fabrications and flights of fancy, positioning the film (honestly, if somewhat troublingly) as a “counter-myth” to the “official myth” of the Warren Commission report. No matter where you stand on the creation of “counter-myth” in fiction or docudrama (and this reviewer, for one, is basically fine with it), your reputation as that sort of fabricator can be something of a liability when attempting to enter the realm of serious journalism. Those lingering questions of credibility were an off-camera concern in his previous short docs, Persona Non Grata and Looking for Fidel; they’re even more distracting in his new film South of the Border. That’s not to say that it isn’t well-constructed or compelling—quite the contrary. He knows, first of all, that there’s no better way to start a lefty doc than with a cold open of the Fox & Friends numbskulls, here seen bloviating on Venezuelan president Hugo Chavez. Indeed, the film opens with a flurry of American television news footage, with Stone illustrating the popular narratives regarding the controversial leader. 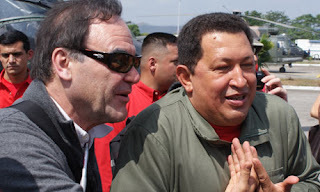 Stone spends roughly the first half of the short (78 minutes) feature on Chavez, going all the way back to 1989 and the fall of the Berlin Wall, the rise of the IMF, and the riots in Caracas to chronicle Chavez’s ascension to power, culminating with his first election in 1998. His difficulties staying in power are covered in detail, including demonstrations that turned violent (and were subsequently mischaracterized in local and international media outlets) and an aborted, one-day coup reportedly backed by the U.S. government. Stone wisely coughs up copious documentation of American involvement, as well as damning footage of Bush administration official Otto Reich getting badly burned on CNN. In the film’s second half, Stone does a hit-and-run tour of Latin America, interviewing several other like-minded leaders: Evo Morales of Bolivia; former Argentinean president Nestor Kirchner and his wife Cristina, the current president; Fernando Lugo of Paraguay; Lula da Silva of Brazil; and Raul Castro of Cuba. Several of the leaders are fascinating figures (Cristina Kirchner is particularly smart and quick-witted), and Stone adroitly pinpoints the cause-and-effect relationship of political power in their countries—how Chavez’s forceful reign has empowered leaders across Latin America to make their own strides towards emboldened independence. But his interviews are so openly fawning—he frequently, on camera, expresses his admiration for them, embraces Chavez several times, and even kicks a soccer ball around with Morales—that any aura of objectivity disappears quickly. There’s simply a sense, throughout the film, that he’s leaving stuff out, and the arguments he’s willing to engage in are handled awkwardly and flimsily. Take, for instance, the inevitable (and important) discussion of Chavez’s human rights record; Stone’s weak sauce response basically boils down to “Well, Columbia’s is bad too,” which doesn’t accomplish anything much more high-minded than “I know you are, but what am I?” It’s a bit of an embarrassment to watch a smart guy like Stone soft-soaping someone like Chavez. "South of the Border" is available now on DVD and Blu-ray. For full A/V and bonus feature details, read this review on DVD Talk.